Laminate counter is flush-mounted and the writing top overlaps, is an angled 1-1/2" thick. It has 7 compartments for 4" x 9" brochures, and angled, laminate sides with fully laminated back. Choice of 7 finishes: cherry, golden oak, walnut, light oak, colonial, red mahogany and black. 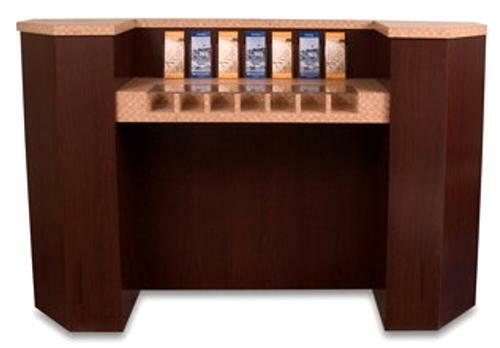 Dimensions: 53" H x 81" W x 20" D.
Laminate counter is flush-mounted, writing top overlaps and is an angled 1-1/2" thick. 7 literature compartments. Choice of 7 finishes.